What I have wanted to try again is a Phukthong Gang Dang which is my favourite Thai Curry. 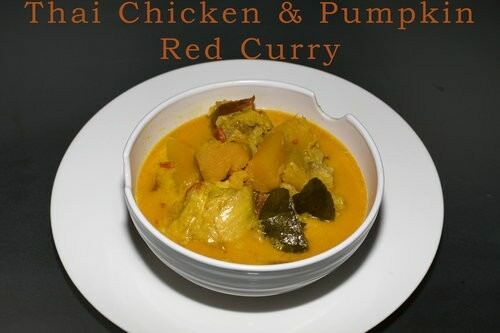 It is Chicken & Pumpkin Red Curry with Coconut Cream. I have repeatedly tried to make the dish but never had absolute success. I am using a slow cooker because I am lazy, and I wanted to make a huge quantity with minimal work. 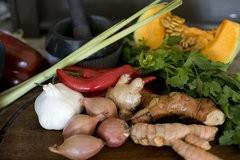 I also like the idea of giving the curry enough time for the flavours to develop. In a mortar and pestle pound the paste ingredients until smooth. Cut each chicken fillet in two and dice the pumpkin into 1-inch squares. In a large non-stick frying pan, fry the paste in oil until fragrant. Add the chicken and cook briefly ensuring it is covered in the spice paste. 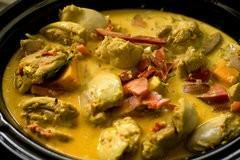 Add 1 can of coconut milk to the chicken curry and stir to remove all the paste from the bottom of the pan. Give the lemongrass a quick bruising in the mortar and chop into four pieces. Add the pumpkin, eschalots, capsicum, galangal lemon grass and lime leaves to the slow cooker. Pour the chicken and curry paste mix into the slow cooker and add the second can of coconut milk. Cook the dish in the slow cooker on low for four hours, or until the pumpkin is soft. The dish will serve approximately 10 people with rice. What was the verdict on the dish; I am in love! I could happily eat this curry every day of the week.